Just as a diamond is brilliant as a result of the arrangement of a multitude of facets, some of the most interesting people are brilliant simply because of their own multitude of facets. As I try to understand what brings individuals together into communities and separates communities into individuals, it dawned on me this morning that it’s these facets. We’re drawn to people who share similar facets to our own, whereas we’re often repelled by differing facets. Facets can easily be translated to perspective, opinion, background, or other characteristics. Sometimes as I listen, watch, or read the news of the day, I’m stymied as I try to understand the contrary view to my own on certain topics. Although I really don’t enjoy conflict, I do appreciate a good fact-based debate on the merits of an argument, resulting in an individual’s opinion about a subject matter. I find that by engaging in fact-based dialogue, conducted in a non-emotional manner, both parties can learn about the differing viewpoint, and sometimes opinions are changed based upon such a thoughtful exchange of ideas. Unfortunately, too many times people engage in discussions about topics to which they have an impassioned viewpoint with emotion instead of facts. Sadly, the news of the day cannot be trusted to provide its audience with an unbiased, fact-based delivery of the day’s events. Instead, invective, bias, and agenda-based narratives are inserted into the news of the day. Individuals are mocked and attacked for having a contrary viewpoint instead of being allowed to explain the foundation from which the viewpoint was arrived. As I’ve transitioned from a career in corporate America to work as a psychic medium, I’ve found the dynamic of differing viewpoints to be especially interesting to experience. “Interesting” because I can argue both sides of whether or not communication with spirit is possible. For much of my life, I didn’t consider spirit communication to be possible and didn’t really think about the possibility much at all. However, that changed after being presented with a contrary viewpoint in the form of receiving information from spirit through numerous unrelated psychics and mediums—many of whom shared similar information that was only known to me. You can embrace the new information fully on faith. I definitely embarked upon this current path by investigating further and have come to the conclusion—based upon empirical evidence—that it is not only possible to communicate with spirit, it is possible for ME to communicate with spirit. However, I’ve also found that people whom I knew before I became a psychic medium have had their own choice to make about how to respond to what for many has been new information regarding spirit communication. The most interesting aspect of the reactions from others has been how personal some of the reactions have been. I don’t feel it’s my role to “convert” people to my current belief. My only role is to answer questions based upon my own research, training, and personal experience. I had expected that the role of others would be to listen without judgment. Unfortunately in some cases, my expectations have not been met, and I’ve been disparaged for doing this work. For some friends and acquaintances, this contrary viewpoint was enough of a diversion to necessitate impairing or severing all relationship ties. This last point made me draw the correlation with the facets of a diamond. 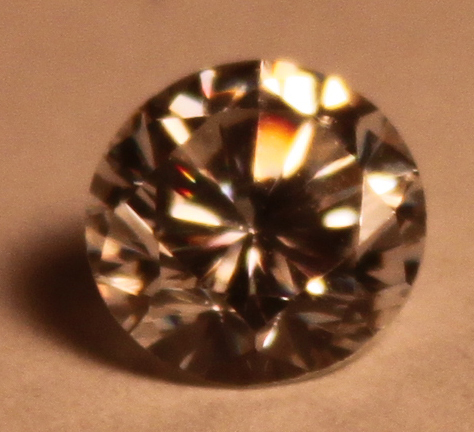 Unlike diamonds, our facets aren’t generally symmetrical. Different subjects are of great importance to different individuals. I used to work with a woman who would explain whether or not she had absolute devotion to something by expressing whether or not she had a willingness to “fall on her sword” for the cause. In other words, there are things that you believe, but you’re not willing to speak out about your beliefs or even stand firm on your beliefs about a certain topic. Conversely, there are other topics, for which you feel great passion and are willing to figuratively “fall on your sword”, without concern for the consequences for standing firm in your position. Each of us is a complex individual comprised of a multitude of facets—each of us as unique as a snowflake (or a diamond). Although it is easier to form communities with only like-minded individuals, individuals increase their facets and become more brilliant when they are willing to really try to understand an opposing viewpoint. To do so effectively involves a strict focus on the issue as if it were a specimen under a microscope. In microbiology, there is no room for emotion or making personal attacks because the specimen has grown in a certain manner (analogous to an individual forming a specific opinion about a topic). Instead, like a microbiologist, it is useful to understand how and why the specimen developed. By understanding the facts of an argument that lead an individual to a certain perspective, both parties become richer and more brilliant for the experience.